How do I find my style? It’s a question that inevitably comes up for almost every photographer actively trying to improve their images. It’s a tough question, at first. Because at first, you don’t really know what that means. Many photographers think that “style” is just equal to how someone might edit their images. They start going down the rabbit hole, curious about how their favorite photographers ended up with those nice blue tones, or desaturated browns on their feeds, or how they have just that little bit of fade in every image. When someone is starting out in photography, they don’t know the trends that have come and gone. The permanence of certain visual language elements that have stood the test of time. Or the kitsch crazes that have been and passed. All of that is okay because that’s the journey we’re all on. The shiny stuff aside, to really find your style in photography, one has to know what this actually means. Style is not a specific “thing”. It’s not something you can just decide to have or not have. Rather, think of style as a toolbox. A toolbox that has been refined over time. When an apprentice builder starts his first job, he does so with a few tools he thinks he might need. Eventually, he finds tasks that he doesn’t have the tools for. He figures things out and adds more tools. Along the way, he finds better, more efficient tools to do the same tasks, and so he swaps out his old tools over time. Eventually, after having nailed thousands of nails and making hundreds of walls, he knows how to do it in his way, fast. Efficient. With style and grace, even. He’s become a master at that task and he sticks to what he knows. Style is a lot like that. It looks a lot like the process of mastery. Your toolbox isn’t just things like cameras, lenses, and drones. It’s not just your choices of blue tones or red tones. It’s not just whether you like sharp images or blurry ones. It’s also more abstract – it’s what you shoot, how you shoot it, and why. Do you shoot landscapes more than urban scenes? Portraits over street? How do you shoot those scenes? Wide? Tight? Abstract? Why do you choose to shoot those scenes and why did you decide to do it in that way? The answer to those questions is the genesis of “style” – the foundation of your toolkit. A mix of knowing what you don’t know, and an alignment of that knowledge to the things you value in your own life. For me, photography is about two things: Adventure and minimalism. My first camera was given to me by my ex-girlfriend. We’d chatted about wanting our relationship to have more adventure, and a camera was a great excuse to get out in the world and start documenting them. I’ve been addicted to chasing new experiences ever since. But I’m also a minimalist. I put a lot of value on the things I bring in to my life. So on a more tactical level in my images, I try very hard to lean in to simple scenes. Scenes that have only 1 focus point, scenes that are immediately understandable and don’t require a lot of abstraction to pull meaning from. I do this because I’m thoughtful about the value I place on my time in real life, and subsequently, I’m cognizant of your time too. Of course, this, like all things in photography, is generally a guideline, not a rule, but it’s something I aim for, and it’s also something that took me a long time of practice, reflection, and a lot (over 100,000) of crappy frames to uncover, and I’m still (and forever) working on it. This is the state of my toolbox right now, and it’s always going to be changing. What value do you give photography in your life? One of my photography idols, Alex Strohl, talks about his work being symbolic of his love towards water. How it features in his images, the types of tones he uses, everything. I’ll let you discover why that is in your own discovery of his work, but this is the genesis of it, and I think the clarity of meaning he’s given his work is great. Start with why and find inspiration (from inside or outside yourself) until you discover the answer. The problem for most beginners (but it never really goes away for anyone) is that you don’t know what you don’t know. There are so many places to gather your inspiration from. So many influences you can apply to your own photography. Don’t think Instagram. Look wider. Look deeper. Expose yourself to as much inspiration you can and take note of what you like and give value to that. Maybe it’s the story of your childhood. The visual treatment of your favorite movie. Your favorite quote from your grandma. A memory of a trip you’ll never forget. How can you turn your life’s experiences into images? Focus on the why and all else will follow. All the other shiny things like gear, settings, and post-processing will be so much better once you have your why. But of course, look for other things that inspire you too – visual language techniques, color palettes, bokeh, focal lengths, big scenes, little scenes, countries, films, everything. They all have a part to play. After you’ve immersed yourself in inspiration and made a list of the things you love and are inspired by, synthesize them into something meaningful. Make sense of your inspiration. Give yourself some maxims to operate by, even if you just write them down and never use them, at least they’ll be in your subconscious for when you’re out in the field. Once you’ve defined what you’re inspired by, it’s much easier to find and make those images in the real world. It might seem silly to make a vision board of your own style. It might seem strange to write down that you like taking photos of animals because you miss your dog at home. The act of getting it down into the real world, to synthesize it, gives you clarity that most other people just don’t have. And when someone asks you “why do you take photographs?”, you’ll have a killer answer for them that will make you feel great and inspire them to think about their own work, too. Once you’ve synthesized your style, you’ve reached the hardest part of it all. Putting yourself out there. It’s time to test it out. At first, alone. Spend time working on it as much as you can. But eventually, with people. Because art really isn’t art until it’s shared, and feedback isn’t really feedback unless someone else is giving it. Yes, it’s scary. Yes, people might not like it. But if you like it, then maybe it’s not for them, and that’s okay. But for the people who do like it, it might just be the best f***ing thing in the world, and without putting it out there, no one would never know. What I love about this stage though, is the impermanence of experimentation. If it’s just an experiment, then it’s temporary. It should be. It means you can take it away or revert back to something else. But it also means that you can make it even better if it’s successful and it works. It’s imperative that every creative sees life in this way. To have the courage to try something new, even if it’s scary. Change is the only method for growth. And once you take your experiment, shown it to the world and both you and the world loves it, refine it. Work on it some more. Keep getting better and better at that thing, because it’s here that the builder becomes a Master builder. It’s here that you can see the finesse in the quality of work. The smooth joins and the perfect vertical lines. It’s also after mastering something that you can see the finesse in the quality of other people’s work and add that to your own inspiration too. It’s the best of all worlds. Because creativity has ebbs and flows. Ups and downs. Sure things and irrational fears. Sometimes you need to just drop everything and start again. Sometimes that’s necessary to create the great work you’ll do in the future. It’s totally fine. It was all an experiment anyway. After all, your toolbox might be a big one. Hell, it might even be well organized. But just like creativity, the contents never really stay the same forever. Happy shooting and good luck. P.S. If you enjoyed this article, please consider checking out my preset pack! Each sale helps support me and my work, and in return you get 25 high quality Adobe Lightroom presets and 15 high-res mobile wallpapers to use! Check them out at shop.patkay.com. About the author: Pat Kay is a freelance photographer and content creator based in Sydney, Australia. The opinions expressed in this article are solely those of the author. Kay has garnered over 65,000+ people on Instagram to share his journey with and works regularly with many great brands such as Sony, DJI, Samsung, Adidas, Nike, Ford, Lexus, Cathay Pacific, and more. You can find more of his work on his website, Instagram, Facebook, and 500px. This article was also published here. A long, long time ago, that is, in days of film photography, it was a rather difficult task to learn how to produce properly exposed pictures. There was no instant feedback and the only way to see how good of a job you did exposing the scene was to wait until the picture was developed. Nowadays, regardless of your skill level or how advanced are you with any photo editing software, if you are using a digital camera, there’s a slice of digital information that can help you instantly adjust your camera settings in order to take a picture with near perfect exposure. This piece of information is probably something that you might have even noticed before, but never really paid too much attention. Indeed, I’m talking about the histogram, which is often overlooked or completely ignored. Yes, I understand, that strange diagram with mountainous peaks might seem too technical to go into too much, especially when you have an LCD display on the back of your camera showing you the picture you just took. However, I believe that there are a number of ways to improve your photography once you understand how to read the histogram. In this article, we will explore the technical aspects of it as well as ways to incorporate it with your workflow on the field and in post-processing. In essence, the histogram is a visual representation of the brightness values of all the pixels in your image. Generally, we use a combined histogram of the three main color channels (red, green and blue) or RGB histogram. However, if needed, you can dwell deeper into the histogram of each individual color channel. First, let’s try to break down what exactly is represented in the histogram. If you look at any histogram you will notice two axis – horizontal and vertical. The horizontal axis represents the number of tones and their level of brightness, starting from 0 (pure black) up until 255 (pure white). The vertical axis represents the number of pixels at each level of brightness. So, if you follow the line within the histogram, those highest “mountain peaks” tell you exactly where on the brightness scale you have the most amount of information about the image. If the “mountain peaks” are stacked more towards the left side, even without looking at the actual image, it tells you that it’s dark. On the contrary, if they are towards the right side of the histogram, the image is bright. This is probably the most essential aspect of the histogram that you would need to remember. For an image to be correctly exposed, you need to stay within those walls on each side of the histogram. If you expose beyond those walls, in photographic terms we call it clipping. So, if any part of the histogram reaches the right side of the wall, the image is considered to be overexposed and means that every single pixel that reaches this wall, will be represented as pure white. In simpler terms, all you will see in the overexposed part of the image is nothing else but white pixels. Similarly, if the histogram touches the left side of the wall, it’s considered underexposed and you are left with pure blacks. Take a look at this picture. Here you have a visual representation of how an underexposed, overexposed and correctly exposed histogram looks like. We established that overexposing and underexposing is something that should generally be avoided, however, there might be situations when dynamic range or difference between the darkest and brightest parts of the scene are so high, that it’s virtually impossible to capture it without clipping either shadows or highlights. Of course, you can use neutral density graduated filters to compensate for the difference or even bracket the shot and correct the exposure in the final image during post-processing. Let’s imagine you don’t have these options or the scene is too complex to bracket without failing miserably. In this case, it is advised to underexpose the scene rather than to overexpose. Modern digital cameras are capable to record quite a lot of information about the details in the underexposed areas and bring them out later during the post-processing of the image. However, it is virtually impossible to recover any of the information in the overexposed areas. Additionally, some cameras are more capable in one thing than the other. For example, Nikon cameras are performing better at recording the details in shadows, so Nikon users have to worry less about underexposing than, for example, Canon users. On the other hand, Canon cameras have a higher capability to record details in the highlights than Nikon users. I would like to mention another aspect of the histogram that might be worthwhile to learn. As I mentioned before, every scene is different and on the whole, there’s no such thing as an ideal histogram as it depends entirely on what are you shooting. However, there’s one piece of advice you might have heard before and I suggest you listen to it: expose to the right! What it means is that you should generally push the exposure to the brighter levels of the histogram. The reason behind it is simple: the number of tones within the horizontal axis of the histogram. Let’s split the histogram into 5 equal parts starting from left to right, from darkest part to the brightest. The first section only has 575 tones available, next one has 1149 tones. These two sections make up the so-called darks in the picture. The third section is composed of mid tones and has 2298 tones within it. Last two sections represent the brightest part of the picture and have a combined number of 13,788 tones available. In simpler terms, if your picture is dark, you will only have a very limited amount of tones available to work with. Let’s say you would like to adjust the picture during the post-processing by increasing the brightness, contrast or do any other changes. Lack of information about the tones will manifest in banding (pixelated gradients), increased noise levels and other problems. On the contrary, if you have a picture that exposed towards the right side of the histogram, you are less likely to run into these problems during post-processing. Another important aspect of learning to read the histogram is that once you understand it there is no need to rely solely on LCD display built inside the camera. Why is it a good thing, you ask? Because the LCD display lies! While it gives a reasonably good interpretation of the image, it’s far from perfect to determine, for example, how correct the exposure is. First of all, the LCD displays only a JPEG preview version of the image, even if you shoot RAW files. Besides, the LCD screen has a much lower resolution than the image itself and the brightness level of the screen might be adjusted too bright or too dim. This is especially important to remember when shooting in very bright or dark conditions. For example, when shooting northern lights, while looking at the screen in these dark conditions, it might seem that the picture on the back of your LCD is correctly exposed, however, this is misleading. This is due to the way how our eyes adjust according to the viewing conditions. In this case, when viewing the picture it in the dark, it will look much brighter than it actually is. There are a number of ways how to implement an understanding of histogram in a photographer’s workflow. First of all, most of the modern cameras have an ability to represent histogram on an LCD screen even before making a shot – through live view mode. This way you can adjust your exposure exactly, even before taking a shot. Ideally, I would suggest making it a habit to check the histogram after each shot. If that sounds too tedious, one can at least use “highlight alert” function built in the camera. Once a shot is taken, it is possible to view the image and allow the camera to detect if there are any areas that are overexposed. Additionally, you can use your knowledge of histogram while making adjustments to an image during the post-processing. Increasing or decreasing brightness might result in lost pixels and to prevent that you can always rely on monitoring the histogram while making sure that no clipping occurs. It doesn’t necessarily make you a professional just because you are able to read the histogram, but learning it can be very helpful at times. I hope that this article helped you to understand the basic principles behind the histogram and with time you will be able to incorporate this knowledge in your workflow and ultimately improve your photography. About the author: Kaspars Dzenis is a landscape photographer based in Iceland. The opinions expressed in this article are solely those of the author. Dzenis conducts photo tours and workshops in his country. You can find more of Dzenis’ work on his website, Facebook, Twitter, Flickr, 500px, and Instagram. This article was also published here. Before Instagram, selfie sticks, disposable cameras, Polaroids, and box brownies, there were carte de visites — small photographic albumen prints, mounted on card, which were wildly popular during the Victorian era. For many people, posing for a carte de visite was the first time they had been photographed. Smiles are almost completely absent. Some people look ill at ease. Most photographers posed their subjects as if they were being painted for a grand oil painting. Look past the stern expressions and you will see Victorian fashion, various accessories and props, uniforms, and hairstyles and epic facial hair. Bottle Corker. This undated photo was taken in Birmingham in the Midlands. We assume a bottle corker was someone who put corks into bottles rather than removed them. Soccer Player. An unidentified Scottish footballer/soccer player. The photo was taken by John Spence of Bridge Street, Musselburgh. Circa 1880. Australian Soldier. Taken in Sydney in 1863, the uniform appears to be that of the New South Wales Volunteer Artillery. Kit Carson. This 1862 carte de visite shows Kit Carson (seated) and Edwin Perrin. Carson was a frontiersman and a Wild West legend in his own lifetime. Here he is pictured in his Union army coat. Perrin led the 1st New Mexico Volunteer Infantry in the American Civil War. General Custer. George Custer in his Union uniform in 1865. The photo is printed from a negative taken by Matthew Brady, who was best known for his Civil War photography. Custer, a Civil War hero, was killed at the Battle of the Little Big Horn in 1876. Man with Top Hat. This gentleman from Palermo in Italy, circa 1870, looks like a true man about town in his immaculate clothing, dapper cane and stupendous top hat laid to one side. Alexandre Dumas Pere & Adah Isaacs Menken. Adah Isaacs Menken was the highest paid actress in the middle of the 18th century. While performing in France in 1866, she had an affair with author Alexandre Dumas, which caused a scandal as he was more than twice her age. Her only book, Infelicia, a collection of 31 poems, was published several days after her death. Hans Christian Andersen. The Danish author of The Little Mermaid and The Snow Queen poses for a carte de visite. A keen traveler, Andersen died in 1875. Victor Hugo. An 1874 carte de visite of Hugo. He published his last novel in 1874, Quatre-vingt-treize, about the Reign of Terror during the French Revolution. Boy and his Toy Horse. Circa 1880s and taken in Liverpool, the smartly dressed boy is also holding a riding crop. Little Artists. Booted and suited, two smartly dressed boys from Naples. Circa 1860. Lady Reading. This Italian lady is completely focused on her book. Circa 1860. Soldier and Wife. Circa 1890, this carte de visite was taken in Bury St Edmonds. The two stripes show that he was a corporal. He’s smoking while she holds a book and looks decidedly uncomfortable. Italian Solider. This military man from Bologna looks completely at ease. Circa 1890s. David Livingstone. “Doctor Livingstone, I presume?” This is the explorer David Livingstone, who was famously found by fellow explorer Henry Morton Stanley in 1871 near Lake Tanganyika in Africa. Three Priests. A trio of Catholic priests in Rome circa 1870. Two are following instructions and posing for the shot but the third isn’t cooperating. Looks like a scene from Father Ted. Sultan of Turkey. Abdul Aziz Khan was the 32nd Sultan of the Ottoman Empire, and reigned between 1861 and 1876. A formidable looking man. William Makepeace Thackeray. Taken in London, undated. William Makepeace Thackeray was a novelist famous for writing Vanity Fair. Edward VII. Taken in September 1863 when he was the Prince of Wales, Edward is wearing full Highland dress. Abergeldie Castle is close to the Queen’s Scottish home of Balmoral. Randolph Churchill. Winston’s dad. Randolph was both Chancellor of the Exchequer and Leader of the House of Commons during his Tory political career. Swiss Costume. Circa 1870, a lady in traditional Swiss dress. Water Carrier. A Venetian water carrier around 1870. Facial Hair. This gentleman from Torino has outstanding muttonchops. Circa 1870. Dad and Kids. It must have been a cold day when this father posed with his warmly wrapped up children. About the author: Richard Davies is the Content Manager at AbeBooks. This article was also published here. Barry shared back in 2017 about how he turned a camper trailer into a giant camera and portable darkroom. But that project is only a slice of what Barry has been working on. He builds cameras out of things like fruit (a melon) and mannequins. And using his homemade cameras, he creates prints on direct positive paper as well as black-and-white paper negatives. The film also shows the inner workings of his camper camera on location while he shot in Dartmoor National Park. Barry also converts an abandoned Royal Air Force air traffic control tower into a camera and darkroom. Rumour has it, American designer Tom Ford is set to take over as chairman of The Council of Fashion Designers of America. According to multiple reports online, Ford will be replacing Diane von Furstenberg as she plans to step down from her current role that she has held for an impressive 13 years. And during which she has dramatically changed aspects surrounding the council as well as in how the fashion world operates. The annual South by Southwest (SXSW) Conference and Festivals has been in full session, with yesterday’s 2019 Film Award ceremony celebrating the talent and creatives that participated in this year’s program. The ceremony took place at the Paramount Theatre in Austin, Texas and is an official qualifying festival for the Academy Awards Short Film competition as well as a BAFTA-recognized festival for the EE British Academy Film Awards. MAYA is a darkroom timer project that was born out of necessity when my old darkroom timer had started to malfunction. It has become a pretty successful crowdfunding campaign so far, exceeding 300% of its initial goal with a few days left to go. Like many people who still have a darkroom, I’ve bought most of the equipment in the used market. As is the case with such niche markets, you can’t always pick your choice from an endless supply of brands, models, and variations so I went for the best deal I could see, a Kaiser 6002 with several boxes loaded with all kinds of darkroom supplies. The seller was one of the nicest people I’ve met and explained in great detail what I was walking out with. In one of those boxes, there was a darkroom timer. He had fully explained that it wasn’t the best timer in the world. It would only have two functions, turn the enlarger lamp on and off at my will so that I could focus and upon pressing the countdown button, it would turn the enlarger on for a set amount of time, making an exposure. Except that every now and then it would get stuck (usually around the 15-second mark) and give me an unending exposure, resulting in crushed blacks and grayed out highlights, depending on how late I was to react to the needle getting stuck. I had looked for replacement timers and I still remember closing down all the tabs in my browser in frustration. Even the simplest timers, similar to what I had, would cost more than I’m willing to pay. As I had gained more darkroom experience, I began to realize I didn’t want a similar replacement anyway. Having such a simple timer became quite limiting as I had begun to work with split grades, multiple exposures, dodging and burning, flashing the paper… Each session I was finding myself more willing to get a much more capable unit, something that would let me set it up as I want and then simply get out of the way as I was making the final print. Then on one such day, I was met with my timer’s much-worsened situation. Now it would get stuck much more often and at every single spot on the dial. It was almost impossible to even make a reliable test strip with repeated 5” exposures. So I began revisiting all the manufacturers who still make a darkroom timer, along with the used ones commonly available. Did not like any of them. I was looking for something more practical. Even though I shoot film, mostly using equipment that was designed and built decades ago, that doesn’t mean I want to work with a badly designed interface with 4-digit numeric codes and lookup tables requiring multiple button combinations and memorizing what and where everything is. It’s 2018 (it was back then), why can’t we have something with a proper LCD? Why is anything with F-Stops so expensive? Why am I expected to pay 350$/€/£ for some add-on which is basically a 0.20$/€/£ electronic part attached to a cable? Why do I have to buy a different model with different capabilities which clearly runs on the exact same hardware, if all I want is some of those capabilities? Why can’t this be done with a simple firmware update? I could do better than this. I knew people were already building simple timers using Arduino microcontrollers. So, why not build something far more advanced? It’s a small computer that is available cheaply and is easily reprogrammable. If it handles 3D printers, CNC machines and all kind of silly robots that you can find all over the Internet, how hard would it be to ask it turn a light off and on? A few seconds after these thoughts, my industrial designer instincts kicked in. “It’s just software in a box”, a voice said from the back of my head. “Just build another box, upload the software and you have a copy that you can sell. If it turns out as good as you imagine it to be, people will buy it”. Can you hear the people queuing up? So I went out, bought two Arduino boards, an LCD and assorted lengths of wire and started working with them. Did a whole notebook worth of sketches of both the physical and the graphical user interface. From the start, I wanted to have dials and a few buttons that I could repurpose as I saw fit. It has a screen, after all. I could communicate with the user, telling what each of these dials and buttons does in a given menu or mode. Yet at the same time, I would keep the two most essential buttons serve only one purpose, one to focus and one to expose. No double clicks, no press and hold, no excuses. Press them and they should do their job. Even though having an LCD is nice and informative, I wanted to have another way of displaying the most crucial information, the countdown time and the contrast filter that I’m supposed to use. For that, I added two large displays to either side of the LCD. Shortly afterward it became natural to look at those displays to figure out what I was supposed to do next when making a print; expose for a certain amount of time, replace the contrast filter, dodge or burn a certain area. After deciding on the basic design language, I began to design the graphical user interface, all the menus and screens. There were many variations, seemingly good concepts that were abandoned shortly after using them in the real world and seemingly dead ends that made it back somehow into later versions. One such concept was replacing the LCD with an E Ink display. Would’ve been easy to read under the red safelight and I liked the idea of displaying a clock face on the e-ink display to act as a progress bar. Had to abandon this idea after realizing even with partial refresh, e-ink displays have a very low refresh rate and a very annoying blink when refreshing the whole screen. Shelved the concept without building a single prototype and maybe I’ll bring it back one day but the progress bar idea made it into the next version of the hardware, as a series of LEDs that visualize my progress along the whole print recipe or the current countdown. Until about that point, the whole thing was still a pet project that I intended to build as a replacement for my timer. When I shared it on a few Facebook groups (The Darkroom and Medium&Large Format film Photography, both excellent places of exchanging information and photography), it was met with great encouragement, very positive feedback and quite a few new ideas. There were also the occasional “yeah cool but I like having a basic timer,” which is still valid feedback, some people don’t care for what I was after at all. That day I had made up my mind, I would prioritize this project, get it out on the market for everyone who’d like to have one and… then what? What if I had built an enlarger as well? Or an automated film processor, some people really like that idea as it’s been demonstrated quite a few times in the last years. What else? There is quite a capable microprocessor inside MAYA and if I had planned the hardware ahead, I could’ve come up with all sorts of darkroom related hardware and make them work with it via a simple firmware update. How about an affordable densitometer? A shutter speed tester? A head probe for people who use cold light enlargers, one of the many great ideas that came from that thread on Facebook? Support for Ilford Multigrade heads? I had already separated the Power Bar (where all the darkroom appliances are connected to) from the control unit so most of these enlarger-unrelated add-ons would simply use the same interface for communication and with the right hardware, I could even use MAYA as a sous vide machine. With all my plans set, I could finally launch a crowdfunding campaign. I knew that there’s a great deal of negativity surrounding crowdfunding projects these days, especially in our community thanks to a few projects who have cheated out quite a few people by either overpromising with fancy looking non-working prototypes or cool-sounding concepts that became to no fruition of any kind. With no previous projects of this kind or a bought-and-repurposed brand name that is familiar in the industry, I had to be as transparent as possible. Which meant taking an extra month or two developing the concept into a later stage, shoot a lot of videos, share them around, show MAYA in use for everyone to see and understand. Since I’m in such a late stage of design, there isn’t much to do before finalizing the product. One aspect that I had not finalized is the final choice of materials and production methods. For that, I had to see how many of these I’d expect to build. Even if I had sold only a handful of units, I could still be able to deliver by using traditional production methods. If I had approached triple digits, I could use some more sophisticated materials and techniques to build them. Deep into triple digits would’ve been pretty much mass production with me being much less involved in most of the steps, except for final assembly, quality control, and delivery. All I had needed in the first place though, was a handful of people to believe in my project. Met that initial goal in about than 39 hours. Had doubled it in less than a week and with only a few days to go, I’ve passed 300% of my initial goal. This could only happen with the help of some lovely people in the community. The people who spread the word around. What we see the most often is all the negativity in the comment section and forum threads but we don’t hear enough praise for people who share their enthusiasm with others. So once again, thank you everyone who had ever left a comment on any of my posts anywhere. Thank you to everyone who shared the word around, in the forums, Facebook groups, mail groups and Discord servers they hang in. Couldn’t have done this without some people spending night after night of their own time, giving me new ideas, feedback and encouragement. We, as a photography community in general, are getting fewer in numbers (even though film photography is actually growing) and the best part of this project has been meeting all the lovely strangers over the Internet. Thank you, everyone. And here we are. With the crowdfunding about to be completed, hard work awaits me. I have to debug my code, do a few experiments with the future projects to ensure compatibility, finalize the design, order and manufacture the parts and put everything together. With the extra funding raised, I’ve already begun working on a few of those steps and assuming everything goes smoothly, will deliver the first batch in July and the second batch in August. About the author: Can Çevik is an industrial designer and film photographer based in Istanbul, Turkey. The opinions expressed in this article are solely those of the author. Çevik is the inventor of MAYA, an advanced darkroom timer. You can find more of his work and photos on Instagram. A few months ago, the Czech car brand Škoda got in touch with Hungarian photographer Benedek Lampert and asked him to shoot car photos. But instead of expensive shoots featuring real Škoda cars, the company asked that Lampert only use 1:43-scale models of the cars. “It sounded interesting, so I accepted,” the 24-year-old photographer tells PetaPixel. Lampert regularly shoots realistic small-scale photos featuring LEGO figurines in dioramas, so he had the necessary background and skills for this commission. Lampert uses as little Photoshop manipulation as possible for his photos, opting instead to spend hours and hours creating miniature scenes with as many real elements as possible (e.g. smoke and dirt). Most of the photos took him 7 to 12 hours each to complete, but one particular shot took a whopping 10 days for set building, concept work, shooting, and post-production. While it would be easier to fake things like motion blur using Photoshop, Lampert actually captured it on camera — the blur you see in the backgrounds and in the cars’ wheels wasn’t the result of digital manipulation. 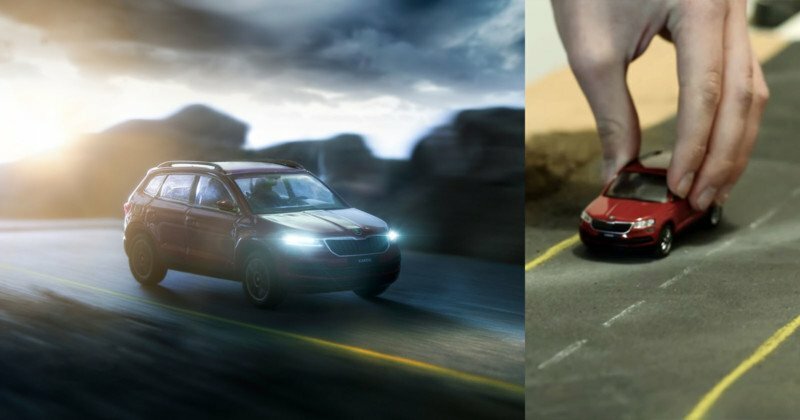 Here are the photos that Lampert created for Škoda, with each one followed by a behind-the-scenes look at how it was created. You can find more of Lampert’s work on 500px. P.S. If you enjoyed these photos, other photographers who are well-known for doing amazing work with model cars include Felix Hernandez and Michael Paul Smith. The Hungarian government has launched a public campaign to encourage couples to have more children. What’s humorous is the choice of stock photo: whoever was responsible for the giant billboards chose the same couple that appears in the well-known “Distracted Boyfriend” photo meme. The original “Distracted Boyfriend” photo by Antonio Guillem. Shot by Spanish photographer Antonio Guillem back in 2015, the “Distracted Boyfriend” photo went globally viral as a meme in 2017. It shows a man with his girlfriend turning around to check out another girl who’s walking by (much to the annoyance of his girlfriend). So it’s hilarious that Hungary decided to use this same couple for its latest ad campaign that aims to increase the country’s birthrate. The billboard went viral after a man living in the Budapest district of Zugló shot a photo of a local billboard and shared it on Facebook. The Internet is now poking fun at the stock photo choice. So it looks like the two models in “Distracted Boyfriend” will now make the rounds on the Internet again in yet another viral photo.